Many things sprouting up around our house, kids notably, but also a few little beans. Jordi and Josie put some black beans in a jar with water and newspaper and put it in the sun. 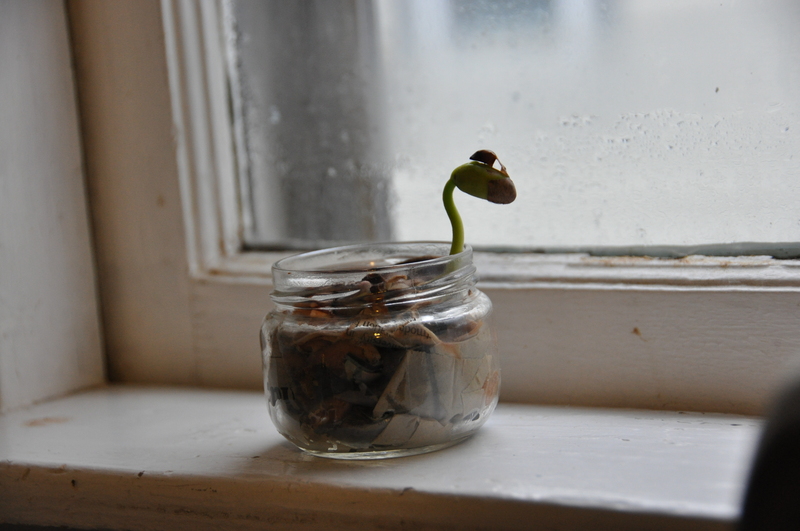 Eventually a few of the beans sprouted and one grew into this little thing. Josie enjoyed looking at it and seeing how it grew. Then it grew mold and it went in the trash. We’re going to try to grow some real plants this spring once I manage to order some seeds. This summer with any luck we’ll have something we grew ourselves, maybe, I just won’t kill these ones if I send them to my mom’s house for her to take care of them once they’ve grown into anything. 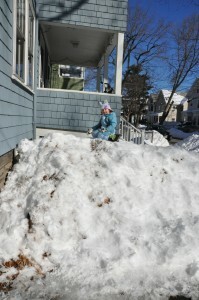 Celia has been working on a few skills as of late. She’s still a big talker and has lots to say, I think we’ll have a loud house from now on, but she’s also working on grabbing and shaking things. She can often get what she wants now and has managed to stick her hand into our dinner a few times now too. Her favorite is to grab things and shove them into her mouth. She’s also clearly working on her sitting up muscles and standing. Josie was starting to sit independently at 4 months so I imagine Celia will be a fast learner too. 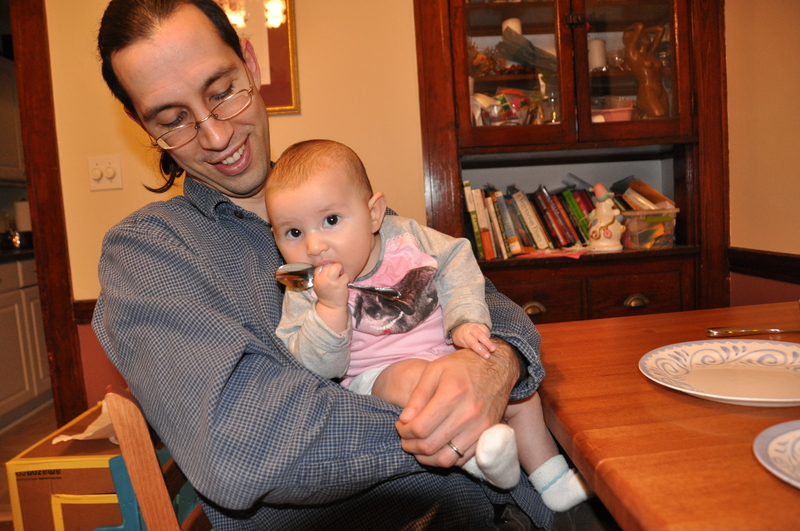 Here she demonstrates her grabbing of the spoon at the dinner table. 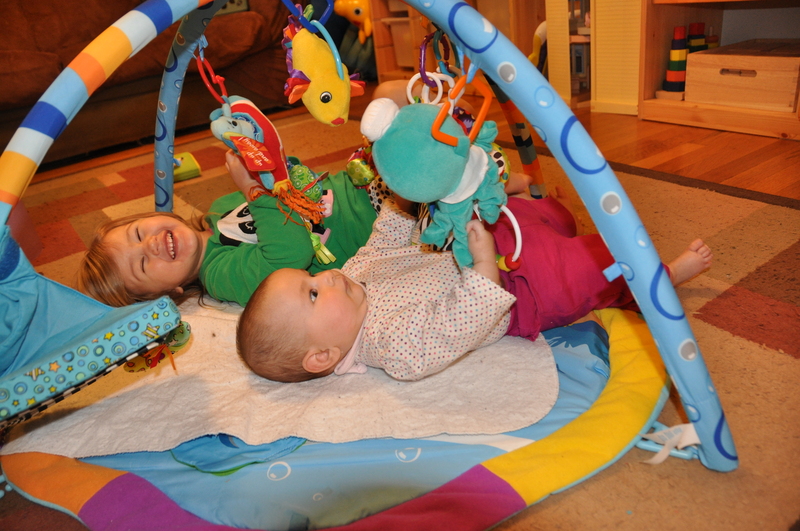 Of course there is nothing better than the toy that your sister has, even if it’s a baby gym. Here’s just one shot of us playing around with the camera outside, it was cold! It’s also her wearing one of the size 4 shirts she’s got, sheesh she’s growing fast! 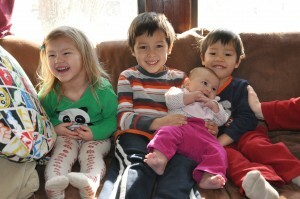 Here’s a snow day photo of the four kids all together! yowza’s, I knew Celia had grown but it looks like she’s up at 13.2 lbs according to our home scale at three months, that’s a lb and a half this month. Josie was 12 lbs at this time, someone’s growing a bit faster! No wonder those clothes look like they keep shrinking in the dryer. Good thing I’ve been working out. Any of you have a recommendation for a hotel near the Fort Lauderdale airport that is clean, inexpensive and has a pool? We just need one night. Today is Celia’s three month birthday! 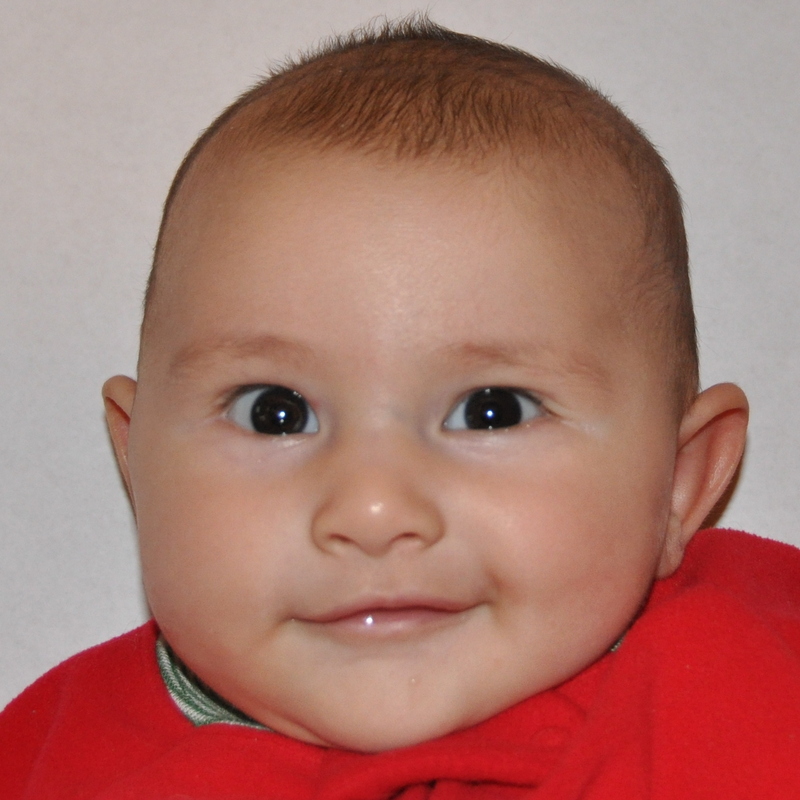 She continues to be a very happy and cheerful baby. She’s generally quite easy going and loves to see all the action going on around her. 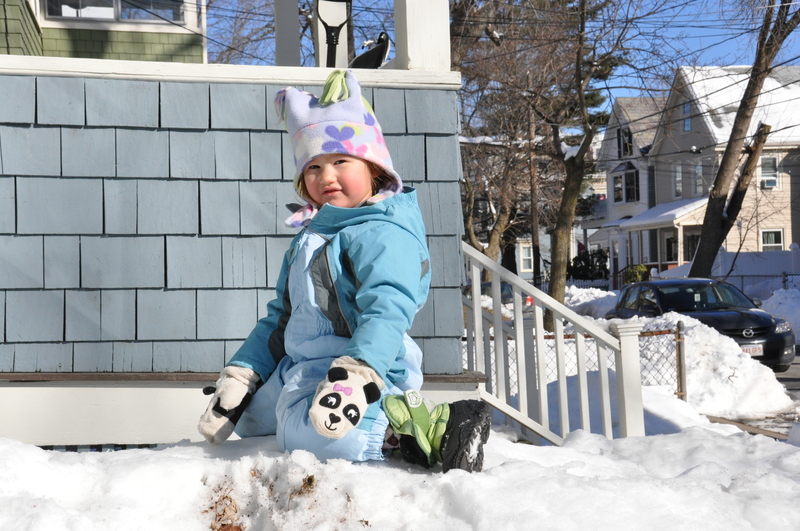 She lights up at playgroups and sing-a-longs, while still enjoying time at home with Josie and I. She still mostly hates the car, but at least falls asleep faster in the convertible seat. Physically she’s getting stronger and more coordinated, as of a little over a week ago she’s bringing things to her mouth, or at least trying to. She can stand on her legs (with us balancing her) for several minutes and insists on it often. She’s grabbing the hanging toys and pulling a bit. She’s decided naps are for the weak and lately I’m only getting one good nap out of her each day of about 2-3 hours. Otherwise she’s doing cat-naps unless I’m wearing her, but she’s going to bed decently early (9pm) and not getting up for the day until 8am-ish. (yes Josie has trained us not to expect much in the sleep department). I don’t have stats as there isn’t a three month appointment but she’s probably around 12.5-13 lbs and 25 inches long. If she follows along Josie’s growth she’ll slow down in that department a lot now compared to the first few months. 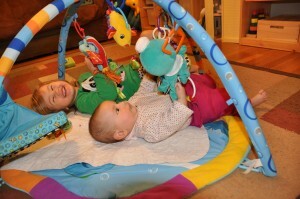 Celia loves to talk, her best time is when I read her my book during Josie’s nap/quiet time. I get to read what I want, and she gets someone talking to her. A few minutes in she just starts talking and never stops, just like me. Perhaps I should try to work on those conversation skills, but mama’s gotta get some reading time in for her own sanity. Here’s a reminder of what Josie looked like. As I learn to be a mom in a family of four, I’m having to pick up some new tricks to make mornings go a little faster sometimes. Timing can be rough between nursing, showering and eating, I can often find myself the slow-cog in the getting us all out the door and into the world (because I need to eat, girls need to nurse, and I want to shower). I can’t change when Celia is hungry, we’ve both learned to shower less often, but making breakfast is something that I can speed up at times now. First help, I got a slow-cooker from my parents for Christmas. I didn’t know I wanted one, but I’ve now found it very useful for many things, most of which I will discuss later. But for now I’ve found it great for cooking oatmeal overnight. I make a water bath for a large measuring cup of milk and steel-cut oats (4-1 proportions), dash of salt, and it cooks on low for 8 hours overnight and is hot for me in the morning. But often I want to eat eggs for breakfast for a big protein boost. I have been trying to toy around with recipes for ‘egg muffins’ which basically means omelet cooked in a muffin tin. I tried this one, at least in general, as I obviously didn’t put any sausage in it and the ‘muffins’ came out very airy and decently tasty for the first time, but deflated quickly and didn’t stay well in the fridge for the next day – which misses the point, I want to make them once and get to eat them for a few days. I have a few in the freezer too, but they haven’t been terribly attractive to me pulling them out. So do you have a good egg casserole/muffin type recipe that is easy to reheat and in small enough portions? I have one broccoli ‘puff’ recipe which combines some flour and cheese with milk in a blender, but it’s rather time consuming and messy to make so I don’t do it often. I need a good morning egg strategy. Maybe I should just boil some? You are currently browsing the JenJordi.org weblog archives for January, 2011.